Why is it that when you have a poor, near fishless, spell, you always hear about other people catching lots of good fish? I tend to push these reports to the back of my mind or I would go mad trying to 'chase the tales' in search of fish. I generally store the details away and (if I believe the stories - I often don't) I try the places/tactics of the successful anglers when conditions repeat themselves. Anyway, that's by the way. It's still quiet at the spots I have been trying. 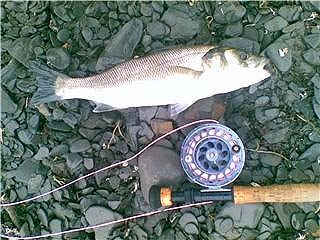 The mullet came in to feed on maggots on the last lot of springs but they were either too thin on the ground or too far out for successful fishing. We managed a few small bass from amid the shoals of mullet and Ben had a bass on the maggot-fly (he thought it was his first fly-caught mullet for a while). 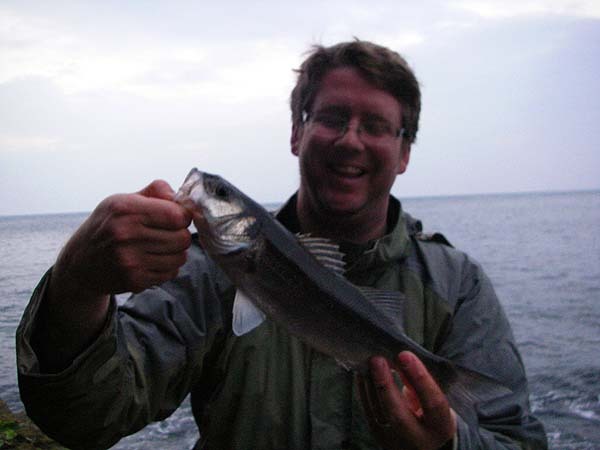 I went with Dave Baker one morning and we caught a mackerel (mine - used as livebait - not a sniff) and a small bass that took Dave's plug as he was lifting it from the water. On another trip Ben had a bass on a fly (and very little else in the way of strikes) but all I managed was a dozen missed bites on my spoon (intended to catch livebait). I'm sure that my bites were tiny pollack nudging the spoon as I missed a few on the fly too. When I'm fly fishing I can see the pollack ring the surface as they dart upwards. Anyway, it has to improve soon eh!